Whether you call it an ERP solution, small business tool or simply manufacturing software, SAP Business One works well in all situations. To be a market leader in today’s manufacturing industry, innovation and rapid response to customer demands are vital. SAP is helping manufacturers tackle these challenges with reliable solutions, created specifically for the industry. With SAP manufacturers are able to react faster to variable market demands, predict operational issues and streamline manufacturing performance overall with one single source of real-time information. Why SAP Business One ERP Solution is best for Manufacturing Industry? SAP at the heart of your solution provides the ability to improve efficiency, transparency and best practice adoption while reducing production time, costs and inventory levels. You can offer customers more innovative, higher quality products and get them to market quickly. Here are some reasons get to know why you need to add SAP solution provider for your ERP business. 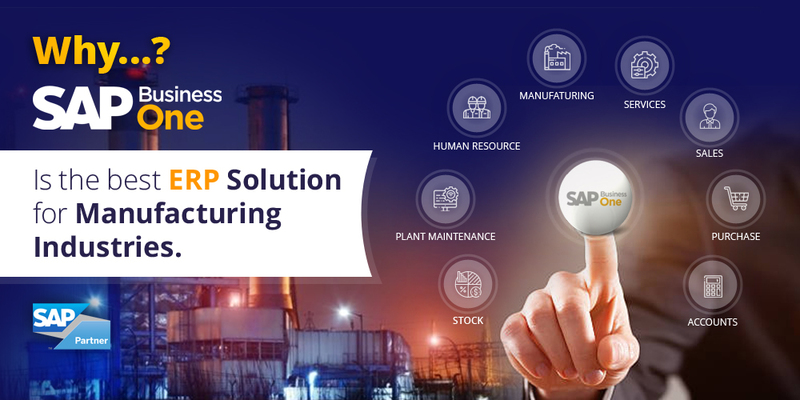 SAP Business One for manufacturing is affordable for SMEs SAP Business One Partners gives you a highly functional and low-cost ERP system for easy implementation. This would require customisation to fit into your existing business infrastructure. SAP Solutions Provider are designed for small and mid-sized businesses SAP Solutions are not restricted for only ERP but are intended for a group to meet the specific business needs and fulfil SMEs requirements. SAP Business One provides fully integrated functionality across systems One can integrate with all the critical business into a single application to connect with all employees. Get a fully functional view of your business with increasing controls. SAP Business One offers the highest ROI If you install SAP Business one for manufacturing, then one should expect to get the highest ROI as SAP Solutions deliver a qualitative benefit across the globe. SAP Business One is very easy to learn and use Some companies do not have time to embark an extensive training, but SAP Business One will provide an effective solution as it’s very easy to learn and use it efficiently. SAP Business One’s future development is assured Purchase a solution from the world leader to get stability and longevity for product development for your business. SAP has paid millions on research and development. Grow your business with SAP Business One Partners As the business requirements are becoming more complex and the team is increasing, then one needs to use the sophisticated internal process growth to meet challenges. Any manufacturing business should map out the workflow to get most out of it. Choose the best ERP software to speak to a vendor by getting the best solution. Make sure you understand which software module is most crucial for your company or industry. SAP Business One is available on HANA as well which is the latest generation and in-memory computing database. Which will give you pervasive analytics, Advance Dashboards, user-based cockpits, sales and service mobile app and much more benefits SAP Business One on HANA is much faster than the traditional systems which will give you real-time data faster on your fingertips. SAP Business One for Discrete Manufacturing eliminates the need for diverse systems and complex integration of multiple modules and help streamline their end to end operations, while SAP Business One for Process Manufacturing manages finished goods, co-products and by-products most efficient way, thereby reducing capital expenditure, gain higher machine and labour utilisation leading to improved ROI. Silver Touch is having vast experience in different manufacturing industries like Machinery Manufacturing, Construction Equipment Manufacturing, Food Manufacturing, Pharmaceutical Manufacturing, Chemical Manufacturing, Rubber Processing and Manufacturing, Electrical Component Manufacturing and many more. Silver Touch Team is having experienced consultants with industry expertise. Do you want to evaluate an ERP for your manufacturing business? If yes, contact us.